Lyft Line, for when you care more about cost than peace and quiet. Back in April, Uber’s smaller, mustachioed competitor, Lyft, quietly acquired a company called Rover, which made real-time tracking software for buses, trains, and taxis. Together, Lyft and Rover started a project that would ultimately become known as “Lyft Line” — a carpooling service that would match Lyft riders going along similar routes and group them together in one car, charging each rider a reduced rate in exchange for sharing the backseat with a stranger. The company beta-tested Lyft Line among its own employees, then, when it was ready, prepped it for the public. It planned to announce the news officially this morning. Yesterday, before the Lyft news had landed, Uber put up a blog post announcing “UberPool,” which appears to be a virtually identical service to Lyft Line. By moving up its announcement to preempt Lyft’s, Uber had both stolen its competitor’s thunder in admirable dog-eat-dog fashion and introduced what it hopes will become the digital-age equivalent of the carpool. Anyway, both Lyft Line and UberPool are out now. (Well, Lyft Line is live — Uber says UberPool will be ready by August 15. Both services are operating exclusively in San Francisco at the beginning, with more cities being added in the future.) 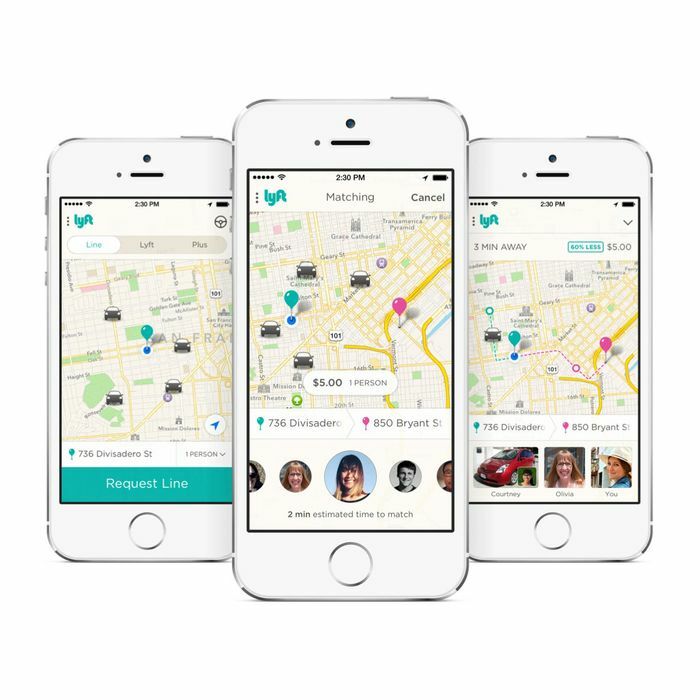 To get a ride on Lyft Line, you simply request a ride through the app’s “Line” feature, type in your destination, then wait while Lyft’s algorithm matches you with one or two other Lyft riders who want to go in the same direction. The driver picks each rider up in order of proximity (curbside wait time for the second and third rider is limited to one minute, to prevent dawdling), and drops all the passengers off at their desired destinations. Lyft is billing Lyft Line as a way to reduce congestion and lower the cost of getting from place to place — ultimately, the company’s goal is to make commuting to work using Lyft cheap enough that you’ll get rid of your car altogether — and Uber presumably wants to do the same thing with UberPool. But the effect of both of these services, if they succeed, could be the completion of a private transportation network that serves people who either don’t live near existing bus or subway lines, or who would rather take an Uber or Lyft to work than ride along a preexisting route. And even though the shared rides will be more affordable than most private transportation options, it raises questions about who, exactly, will fund public transit lines, if everyone who can afford to commute in an Uber or a Lyft car is taking one to work. Like the old carpool model it hopes to replace, riding in an Uber or a Lyft with strangers will also introduce some interesting social questions. What if you’re placed in the backseat with a jerk? What’s the etiquette about about calling shotgun? How many people will get dates out of this thing? Lyft has other concerns on its plate — namely, getting up to speed in New York, where it just launched amid a regulatory tangle — but Lyft Line is an area where it could be able to steal business from Uber by offering cheaper options. Though, if its announcement’s timing is any indication, Uber is ready for yet another fight.